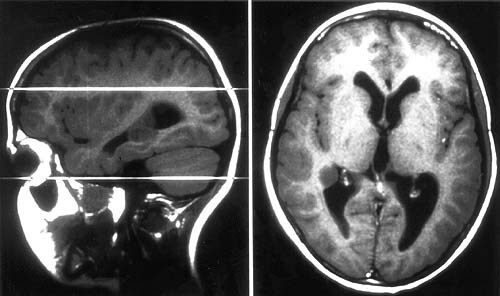 This 16-year-old young man presented in 1993 with headache, nausea, and vomiting. Magnetic resonance imaging (MRI) study revealed a solitary brain tumor at the trigonum of the right lateral ventricle (Fig. 1). No contrast enhancement was noted. The tumor was totally removed in 1994 as demonstrated by the preoperative scan (Fig. 2, left) and a postoperative scan (Fig. 2, right). 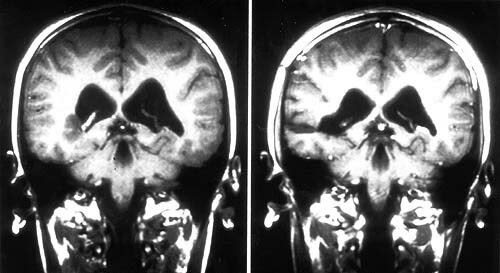 MRI in February 1995 showed recurrent tumor tissue lateral to the temporal horn of the right ventricle. In October 1995, tumor recurrence had enlarged in size. A concentric limitation of the visual field occurred seven months later in May 1996. In November 1996 the recurrent tumor tissue demonstrated for the first time contrast enhancement on MRI. 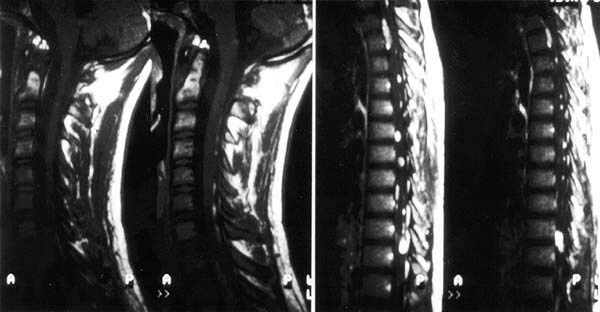 In February of 1998, extensive dissemination of the tumor along the supratentorial ventricular system and the spinal leptomeninges was noted during a routine control MRI scan (Fig. 4). No recurrent tumor tissue was present at the primary site of operation. The patient had no clinical symptoms. 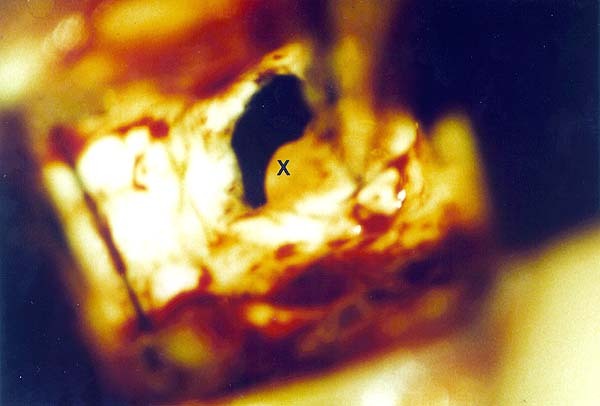 Multiple nodules, up to 5 mm I size and markedly contrast enhancing, were found in both lateral ventricles, the III ventricle (Fig. 4), and the spinal cord (Fig. 5). With MRI criteria they all looked identical. One of them was removed using neuronavigation (Fig. 6, green line; Fig 7, 'X'). An Ommaya reservoir was implanted. 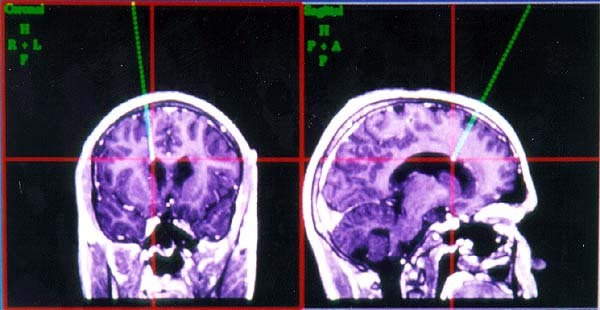 The patient recieved systemic chemotherapy with vincristin and carboplatinum, under which tumor nodules had not changed in size by the end of December 1998.